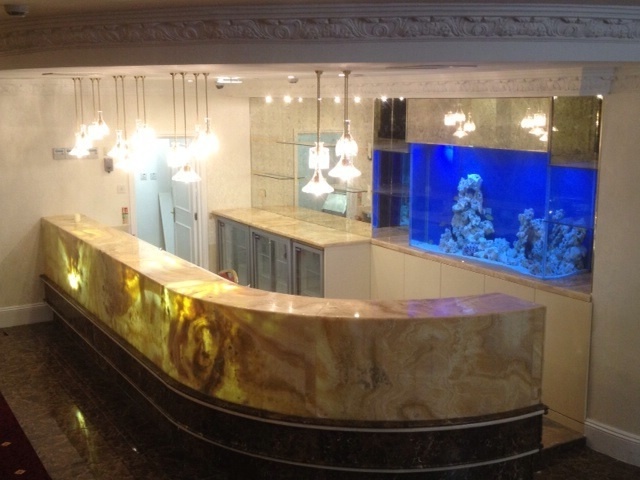 This bar aquarium was installed in a wedding venue in North London. It was built in 19mm glass due to its height, this also gives it additional strength. The aquarium is on a purpose built steel stand as it weighs around 1300 kilograms. It is lit with led lighting and has external filtration below. The rear of the aquarium was sprayed blue in the factory, we can spray the back of our aquariums in any colour. Our clients have an in house maintenance man who looks after the aquarium when required. It has been stocked with a range of tropical fish including red parrots, Malawi cichlids and plecostomous which help to keep the glass clean. In spite of its size we were able to deliver the aquarium in one piece.